Gertrude P. Spence married (?) Smith. Gertrude P. Spence was born on 16 November 1915 at Oklahoma. She was the daughter of Walter Pearl Spence and Ann Wofford. Gertrude P. Spence died on 13 May 1998 at age 82. She was buried after 13 May 1998 at Dickson Cemetery, Cherokee City, Benton, Arkansas. [S243] U.S. Federal Census 1920 U.S. Federal Census, by Ancestry.com, Year: 1920; Census Place: Township 2, Delaware, Oklahoma; Roll: T625_1458; Page: 4A; Enumeration District: 36; Image: 488. Married Name Her married name was Harrington. Ruby Spence married Theodore R. Harrington. Ruby Spence was born on 2 August 1917 at Oklahoma. Ruby Spence died on 3 August 2003 at age 86. She was buried after 3 August 2003 at Dickson Cemetery, Cherokee City, Benton, Arkansas. Married Name Her married name was Dobbs. Ethel Elizabeth Spence married Floyd Everett Dobbs. Ethel Elizabeth Spence was born on 22 May 1919 at Oklahoma. Ethel Elizabeth Spence died on 20 November 1997 at Merced, California, at age 78. She was buried after 20 November 1997 at Deep Creek Cemetery, Farmersville, Tulare, California. Married Name 5 May 1939 As of 5 May 1939,her married name was Hamilton. Lucille Marie Pickel was born on 31 December 1915 at Wisconsin also reported as Mar 26, 1917. She was the daughter of William C. Pickel and Emma Olson. Lucille Marie Pickel married Merton James Hamilton, son of James E. Hamilton and Sarah Wealthy Israel, on 5 May 1939. Lucille Marie Pickel died on 1 December 2000 at Grant, Wisconsin, at age 84. She was buried in December 2000 at Mount Pleasant Cemetery, Cuba City, Grant, Wisconsin. [S243] U.S. Federal Census 1920 U.S. Federal Census, by Ancestry.com, Year: 1920; Census Place: Smelser, Grant, Wisconsin; Roll: T625_1988; Page: 3A; Enumeration District: 124; Image: 455. Married Name 6 March 1918 As of 6 March 1918,her married name was Hamilton. Geverda Selma Isakson was born on 30 May 1899 at Minnesota. She married Walter Hamilton, son of James E. Hamilton and Sarah Wealthy Israel, on 6 March 1918. Geverda Selma Isakson died on 26 April 1984 at Montana at age 84. She was buried after 26 April 1984 at Mountain View Cemetery, Columbus, Stillwater, Montana. Name Variation Eleanor E. Aureden was also known as Elaine. Married Name Her married name was Hamilton. Eleanor E. Aureden married George Hamilton, son of James E. Hamilton and Sarah Wealthy Israel. Eleanor E. Aureden was born on 27 May 1903 at Wisconsin. She died on 28 March 1998 at Dubuque, Dubuque, Iowa, at age 94. Name Variation Florence Barbara Pickel was also known as Barbara Florence. Married Name before 1930 As of before 1930,her married name was Hamilton. Florence Barbara Pickel was born on 5 February 1904 at Wisconsin. Florence Barbara Pickel married Charles Hamilton, son of James E. Hamilton and Sarah Wealthy Israel, before 1930. Florence Barbara Pickel died on 17 March 1975 at Grant, Wisconsin, at age 71 Mrs Charles Hamilton (Florence Pickel) obituary. 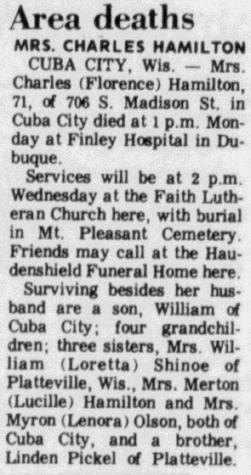 She was buried after 17 March 1975 at Mount Pleasant Cemetery, Cuba City, Grant, Wisconsin. Married Name before 1937 As of before 1937,her married name was Hamilton. Louise Helena Scharff was born on 15 July 1916 at North Dakota. She married Edward Hamilton, son of James E. Hamilton and Sarah Wealthy Israel, before 1937. Louise Helena Scharff died on 27 April 1995 at Grant, Wisconsin, at age 78. She was buried after 27 April 1995 at Mount Pleasant Cemetery, Cuba City, Grant, Wisconsin. Frederick Hoag Sr. was born on 14 October 1892 at Iowa. He was the son of Daniel Hoag and Amanda Cole. Frederick Hoag Sr. married Beulah Hooser, daughter of Justus D. Hooser Jr. and Bertha Florence Hooks, before 1918. Frederick Hoag Sr. died on 31 May 1974 at Iowa at age 81. Daniel Hoag married Amanda Cole. Daniel Hoag was born circa 1851 at Iowa. Married Name Her married name was Hoag. Amanda Cole married Daniel Hoag. Amanda Cole was born circa 1861 at Iowa. Myrtle Belle Mundon was born on 20 March 1906 at Lima, Grant, Wisconsin. She was the daughter of Edward George Mundon and Margaret Jane Loeffelholz. [S244] U.S. Federal Census 1910 U.S. Federal Census, by Ancestry.com, Year: 1910; Census Place: Lima, Grant, Wisconsin; Roll: T624_1711; Page: 2A; Enumeration District: 0032; FHL microfilm: 1375724. [S243] U.S. Federal Census 1920 U.S. Federal Census, by Ancestry.com, Year: 1920; Census Place: Lima, Grant, Wisconsin; Roll: T625_1988; Page: 4A; Enumeration District: 110; Image: 120. Edward G. Mundon was born on 27 July 1899 at Grant, Wisconsin. He was the son of Edward George Mundon and Margaret Jane Loeffelholz. [S245] U.S. Federal Census 1900 U.S. Federal Census, by Ancestry.com, Year: 1900; Census Place: Lima, Grant, Wisconsin; Roll: 1790; Page: 9B; Enumeration District: 0041; FHL microfilm: 1241790. [S250] U.S. Federal Census 1930 U.S. Federal Census, by Ancestry.com, Year: 1930; Census Place: Platteville, Grant, Wisconsin; Roll: 2574; Page: 4A; Enumeration District: 40; Image: 609.0; FHL microfilm: 2342308. John M. Mundon was born in December 1891 at Wisconsin. Frank Mundon was born circa 1905 at Wisconsin. Name Variation Fred Mundon was also known as Freddie. Fred Mundon was born circa 1905 at Wisconsin. Married Name before 1926 As of before 1926,her married name was Belcan. Lucile Mundon was born circa 1909 at Wisconsin. Lucile Mundon married (?) Belcan before 1926. [S373] U.S. Federal Census 1940 U.S. Federal Census, by Ancestry.com, Year: 1940; Census Place: Platteville, Grant, Wisconsin; Roll: T627_4481; Page: 18A; Enumeration District: 22-41. Gladys Mundon was born circa 1911 at Wisconsin. (?) Belcan married Lucile Mundon, daughter of Edward George Mundon and Margaret Jane Loeffelholz, before 1926. Name Variation Michael Loeffelholz was also known as Mike. Michael Loeffelholz was born on 13 March 1866 at Minnesota also reported as Mar 1865. He married Theresia Dietzel circa 1890. Michael Loeffelholz died on 3 April 1932 at age 66. Name Variation Theresia Dietzel was also known as Theresea. Name Variation Theresia Dietzel was also known as Thersea. Married Name circa 1890 As of circa 1890,her married name was Loeffelholz. Theresia Dietzel was born on 4 September 1869 at Wisconsin also reported as Sep 1870. She married Michael Loeffelholz circa 1890. Theresia Dietzel died in January 1967 at age 97. Theresia Dietzel had 5 with 5 living in 1900 children. She had 12 with 10 living in 1910 children. Name Variation Elmer Dieter was also known as Deiter. Elmer Dieter was born on 16 February 1897 at Wisconsin. He married Ethel Hamilton, daughter of James E. Hamilton and Sarah Wealthy Israel, before 1919. Elmer Dieter died after 1930 at Grant, Wisconsin. James Henry Gregory was born on 18 November 1881 at Grant, Wisconsin. He married Harriet Golden Hooser, daughter of Benjamin Butler Hooser and Lola Louise Wright, on 26 March 1907 at Grant, Wisconsin. James Henry Gregory died on 31 May 1958 at Grant, Wisconsin, at age 76. Robert Travis married Elsie Julana Hooser, daughter of Benjamin Butler Hooser and Lola Louise Wright. Robert Travis was born in 1872. Married Name after May 1940 As of after May 1940,her married name was Clark. Unknown (?) married Howard Ralph Clark, son of James Monroe Clark and Della Angeline Cummins, after May 1940. Married Name circa 1928 As of circa 1928,her married name was Clark. Vera E. (?) was born circa 1910 at Iowa. She married James Samuel Clark, son of James Monroe Clark and Della Angeline Cummins, circa 1928. [S250] U.S. Federal Census 1930 U.S. Federal Census, by Ancestry.com, Year: 1930; Census Place: Waterloo, Black Hawk, Iowa; Roll: 643; Page: 21A; Enumeration District: 21; Image: 427.0; FHL microfilm: 2340378. Name Variation Earl Joseph Intermill was also known as Jossef E.
Name Variation Earl Joseph Intermill was also known as Joseph Earl. Earl Joseph Intermill was born on 23 January 1888 at Iowa. He was the son of Rudolph Intermill and Caroline Portz. Earl Joseph Intermill married Esther L. Clark, daughter of James Monroe Clark and Della Angeline Cummins, circa 1919. Earl Joseph Intermill died on 1 September 1969 at age 81. He was buried after 1 September 1969 at Oakland Cemetery, Fort Dodge, Webster, Iowa. 1 January 1925 Wahkonsa, Webster, Iowa Earl Joseph Intermill appeared on the census of 1 January 1925 at Wahkonsa, Webster, Iowa. [S250] U.S. Federal Census 1930 U.S. Federal Census, by Ancestry.com, Year: 1930; Census Place: Fort Dodge, Webster, Iowa; Roll: 688; Page: 26B; Enumeration District: 42; Image: 220.0; FHL microfilm: 2340423. [S373] U.S. Federal Census 1940 U.S. Federal Census, by Ancestry.com, Year: 1940; Census Place: Fort Dodge, Webster, Iowa; Roll: T627_1212; Page: 28B; Enumeration District: 94-45. Rudolph Intermill married Caroline Portz. Rudolph Intermill was born circa 1855 at Czech. Republic. Married Name Her married name was Intermill. Caroline Portz married Rudolph Intermill. Caroline Portz was born circa 1865 at Iowa. Name Variation Theodore Arthur Topel was also known as Theo. Theodore Arthur Topel was born on 17 May 1895 at Linton, Allamakee, Iowa. Theodore Arthur Topel married Geneva Gertrude Clark, daughter of James Monroe Clark and Della Angeline Cummins, circa 1923. Theodore Arthur Topel and Geneva Gertrude Clark were divorced before 1940. Theodore Arthur Topel died on 23 March 1982 at Crawford, Wisconsin, at age 86 Services for Theodore Topel were held Thursday, March 25, 1982, at Schultz's Funeral Home. Monona, with Rev. Curtis Webster officiating. Pallbearers were Carlton Schlitter, Donald Schlitter, Eldred Schlitter, David Schlitter, Alfred Topel, and Robert Schlitter. Burial was in the Monona City Cemetery. Theodore Arthur Topel, the son of Charles and Mathilda (Schlitter) Topel, was born May 17, 1895 in Linton Township, Allamakee County, Iowa. He was married to Geneva Clark, to this union three children were born. He worked on the railroad and did some farming. He died Tuesday, March 23, 1982, at Memorial Hospital, Prairie du Chien, Wis., having reached the age of 86 years, 10 months, 6 days. Preceeding him in death were his parents; one son Ardan; four brothers, Albert A., Herman, Charles, Clarence. Surviving him is his daughter, Romona; son Leland; his sister Minnie Klima of McGregor; two brothers, George and Elmer, both of Monona. He was buried on 25 March 1982 at Monona Cemetery, Monona, Clayton, Iowa. 1 January 1925 Linton, Allamakee, Iowa Theodore Arthur Topel appeared on the census of 1 January 1925 at Linton, Allamakee, Iowa.